Ourcute flower style medial id alert key chain is great for girls, tweens, teens and adults too! 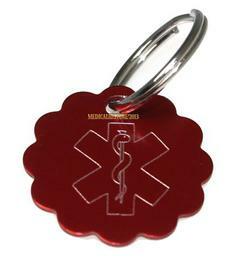 Flower medical alert tag measures appr. 1 1/4" in diameter and is available in 5 different colors. Medical Alert flower keychain key tag has the engraved medical alert symbol on the front and the back will be custom engraved with up to 5 ines of engraving. Also can be used as a luggage tag, on your childs book bag, back pack, diaper bag too!